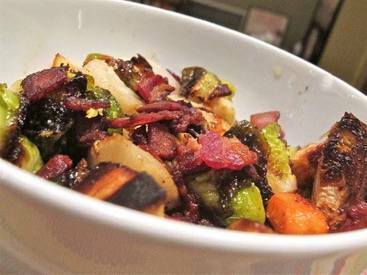 Roasted bacon coated brussels sprouts! Sick of the Bacon-on-everything trend yet? It’s gotten a bit silly, hasn’t it? (NO!) It can certainly be argued that this trend directly corresponds to the recent general improvement of Bacon quality (so many hardwood smoked Bacons'…take that Oscar Meyer!) in America. However, this trend has also resulted in people thinking it’s a good idea to give Bacon lovers remarkably silly Bacon-related gifts, and enthusiasts producing improperly made Bacon ice creams (pro tip: a bit of rendered Bacon fat in the mix is a good idea, but don’t mix the Bacon bits into the ice cream until right before serving). This has cast a shadow of the wonderful world of Bacon. Well, overexposure will do that.